Australian Polish Benevolent Association Inc. The Polish Retirement Home was built and opened in 1993 thanks to the generosity of the Polish community in Victoria and the Federal Government. It is a government subsidised Hostel, operating to approved standards set by the Federal Department of Health and Aged Care. The Polish Retirement Home is administered by the Australian Polish Benevolent Association (APBA) of Victoria Inc. APBA is a non-profit community organisation established in 1986. With a Victoria-wide membership, its Committee of Management is elected annually. The Polish Retirement Home is a modern purpose built hostel for the elderly members of the Polish community. The cultural and linguistic needs of our residents are the central core principle of our hostel. Our professionally trained caring personnel provide 24-hour care to maintain dignity, self-respect and independence of resident. We are a flexible and multilingual service, including English, Polish, Ukrainian, Russian and other Slavic languages being spoken by our staff. Accommodating 29 permanent residents and one respite resident, the Polish Retirement Home offers bright, spacious, comfortable and relaxed living within a warm and friendly environment. Respite care is offered for short stays (63 days in a financial year) and is often a good way to be introduced to long-term hostel living. For the majority of elderly people the transition from the family home to a new way of living can be daunting. It is difficult to leave their home, which holds many memories. The neighbourhood is familiar and family and friends often live close by. However, in some cases, moving to a hostel is the right and best decision. It means moving into accommodation shared with other elderly people. More importantly, it means receiving the help and support to live comfortably and securely. Thanks to advertised methods such as in Polish Weekly, Radios SBS Polish language program and Community Radio 3ZZZ we were able to keep our Hostel of 30 beds (29 permanent and 1 respite) fully occupied. Respite bed is also available for short term stay. (365 days at 63 days entitlement for every estimated booking). We provide extensive care to our Residents as long (as mentioned previously), as it is possible. We are exercising the same policy “Aging in Place” as are the majority of other age care facilities – in many cases reaching the care given what were previously described as in nursing homes. Appropriate assessments and transfers are arranged when the extensive care becomes too much or the hostel facilities proved to be inadequate to carry out the essential treatment. Personal Care – Residents Classification – ACFI as Aged Care Funding Instrument. Personal Care Workers Training – appraisals of professional understanding and consequently performance. Occupational Health and Safety Committee. Activity Programs : Mobility program, Falls Prevention Program etc. Staff training. On site : First Aid & CPR (Cardio Pulmonary Resuscitation training). Manual Handling Training, Fire Safety training. Food Safety program – audit and Certificate was achieved. Medication Review / Advisory Committee. In General, we have continued to improve the high level of personal care, which is directed towards the individual needs and well being of each of our Residents. Dr. Eric Choo provides regular medical services to the Residents on-site once a week and is “on call” every day and night if required. Any specified medical service can be arranged through the visiting practitioner ,if required. Personal and family contact with the visiting medical practitioner is encouraged. Other key services are available by arrangement on site at the hostel such as pharmacy, optometry, physiotherapy, podiatry , hearing services, domiciliary dental services, beautician services and relaxation massages. Royal District Nursing Services is arranged if required. Our Hostel like any other ethno-specific Hostel in comparison to mainstream aged care facilities is the “Polish” nature and atmosphere created by a Service provided by Polish people for Polish people. The cultural and linguistic needs of our Residents are not just “additional” criteria within the way our services are delivered. It is as we term it - the care of cultural principle of our organization. Cuisine: Food plays a cultural role within an elderly person’s life. For that reason our Hostel emphasizes that the food prepared and served to our Residents meets the “Polish palate”. Dietician has been contracted to advice on nutrition and diabetic menu. As previously Residents are always invited to have a main input into the daily menus through meetings with kitchen Staff to make sure that a full menu of traditional cuisine is served in accordance to Residents preferences. Fresh products from local / organic farms were introduces throughout the year. Pastoral Services: Religion, Faith is an important element in the lives of elderly Poles. The Fathers of Society of Christ Order provide religious services for Roman Catholic Residents; the Holy Mass is conducted every Saturday and other Catholic Church celebrations. Appropriate chaplains provide other Religious ceremonies. Families and individuals from local Polish Community are encouraged to participate in these services. Special Events: Like every year special events become a tradition i.e. celebration of Christmas Eve and Easter in Polish tradition in the company of the visiting clergy, Residents families ,Staff members and the Committee of Management . Traditional food is served and gifts are presented to the Residents at those special events. Fund raising events have become also a tradition like Annual Fete in Oct / Nov each year. Five days a week - “activities” sessions are being conducted. During these sessions the Residents enjoy light physical exercises, sitting dances, reading of books/novels, current affairs - Polish and Australian newspapers, discussions, dancing and singing, playing games like cards & bingo, walking in the gardens, bowling , English Language lessons , aromatherapy , cooking sessions , etc. New activity “Mindfulness” provided by polish speaking psychologist , Mrs. Hanna Gorski helps to decrease anxiety, improves social connections and assists with breathing techniques. 'Music Club' is also very popular among Residents, it is providing relaxation and musical stimulation and a lots of fun. Residents continue with pleasure to take part in MOBILITY PROGRAM and Falls Prevention Program . They enjoy daily walks through walking paths around the Hostel. Those programs greatly improved Residents health and are promoting independence. Every Wednesday Residents participate with a group called “ Prayer and Sing along Group”. During this session Residents pray, sing religious, scouts & patriotic songs,. This session usually attends 95% of Residents. Staff Members ensure that every Resident has been provided with emotional support on daily bases to promote their wellbeing in our facility – during ‘One to one’ sessions. Through the introduction of Pet Therapy - Residents have been enjoying a company of two beautiful cats -Maciuś and Sisi- which has provide them with ‘home like atmosphere’, and now a new friend , a dog called Bentley. During the year (seasonal) excursions are organized to shopping centres & restaurants. 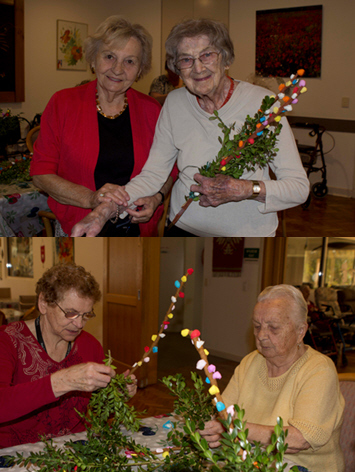 Approaching Christmas time, the Residents make decorations for the Christmas tree. At Easter time traditional painting of eggs is taking place. Finished products are usually displayed in our dining room and lounge for all visitors to admire. All the services are very beneficial for the Residents – for their mental and physical health. Gazebo and walking paths around the Hostel provides excellent outdoor activity. Our Activity Programs are very well planned – and individually implemented. For permanent or respite stay at the Polish Retirement Home, an assessment has to be obtained from an Aged Care Assessment Service (ACAS) team, through a referral from a doctor or a community worker. Fees and charges are payable in accordance with Government legislation. Permanent residents pay an Accommodation Bond based on Commonwealth government means test assessment.. The residue of the bond is refundable on departure. Full pensioners without assets pay 85 per cent of their prescribed pension. Respite care residents are not required to pay an Accommodation Bond. Medication and other expenses, such as chemist, podiatry, dentist, hairdressing are paid by the resident. Detailed information on bonds and fees is provided on request. Income Tested Fee: Residents may be charged extra up to $10.66 per day depending on their income assessed by Centrelink Assets Test . The basic daily fee increases in line with Age Pension increases in March and September each year. Resident Aged care Accommodation Fees are payable monthly in advance from the date of entry to Polish Retirement Home in Bayswater. Australian Polish Benevolent Association of Vic. Inc.
Acc. bond/RAD is fully refundable if the Resident leaves the facility. The way the accommodation bond is paid may affect your pension in the future. It is recommended that financial advice be sought in relation to the best payment option. The Australian Government’s free Financial Information Service is available through Centrelink. It provides information about using your money to best advantage and how the pension income and assets test work. Centrelink can be contacted on 12 23 00.